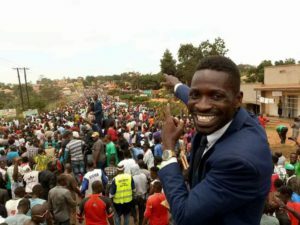 Musician Bobi Wine heads for his final campaign rally following his release from police custody. Courtesy photo. KASANGATI – Kyaddondo East MP-elect Robert Ssentamu Kyagulanyi has promised supporters that he will stand tall in advocating for pro-people policies in Parliament. In a victory note released immediately after the Electoral Commission declared the youthful musician winner of the June 29 by-election Bobi Wine as he is popularly known said he would tackle issues that affect the common people. “I have promised that I will be the voice for the common person- ‘eddoboozi ly’omuntu wabulijjo.’ I begin now. This term must be about the people. Let us work together to restore integrity in our leadership. Our strength will lie in our unity ” he said. Thanking all his supporters beyond the constituency, the popular musician promised not to let them down. “Young people- be inspired! I am grateful that you have embraced my message- the future isn’t tomorrow. The future is today! I know your expectations for me are high and I am ready to make you proud,” he said. Mr Kyagulanyi was declared winner of the by-election with 25,659 votes, in a thumping victory that relegated his four opponents; incumbent and FDC candidate Apollo Kantinti (1832 votes), NRM’s Sitenda Sebalu (4552), and independent candidates Muwada Nkunyingi (575), and Kayongo Sowedi (377) to a peripheral showing in the elections. This 29th day of June marks a turning point in the politics of our country! History has been made. The people of Kyadondo East have spoken and their voice is being heard far and wide! The resounding victory is testament that the people of Kyadondo, and indeed the people of Uganda are ready for a new kind of leadership- a leadership which truly represents them. A leadership of the people, by the people and for the people in its true meaning! A leadership in which the citizen is truly the king and the leaders are true servants! Let the spin masters not try to twist this and come up with all sorts of explanations for our victory- this is nothing but the voice of the people! This victory is evidence that when people are united in purpose there is nothing out of their reach. This victory is not mine. This is your victory! My deepest thanks go to all my supporters across Uganda and the world. The people of Kyadondo East, my campaign volunteers- those who spent sleepless nights on the campaign trail, those who made sacrifices to make this happen- THANK YOU. For resisting all forms of intimidation and machinations, and turning up to vote in large numbers- THANK YOU. Most of you kept at the polling stations, and remained vigilant to ensure that no one stole your victory. You have proven once again that people power is more powerful than the people in power! To my wife Barbie and our dear children you know how proud I am of you for being part of this journey from the very first day! Now is the time to get to work. That means that we must put our differences aside and come together to build a great future for our constituency and for our country. Our people have made it clear that now is the time to cause positive change in Uganda. We shall embark on causing this change in our small neighborhood and hopefully show our brothers and sisters all over Uganda that IT IS POSSIBLE. Our eyes have been opened. Let us not go back to sleep. We know what we need. We know what we deserve. Now let’s go get it. It will not be about me, but about us. I have promised that I will be the voice for the common person- ‘eddoboozi ly’omuntu wabulijjo.’ I begin now. This term must be about the people. Let us work together to restore integrity in our leadership. Our strength will lie in our unity. Even if you did not vote for me and perhaps we disagree on some things, let the love we share for Uganda unite us to work for a better future for ourselves and our children. Those who ran with me in this election, I must congratulate you for putting up a spirited fight. I pledge to work with you for the good of our constituents. I ran as an independent because I thought as I do now, that there is something bigger than political parties- the spirit of our nation. We must never forget that what unites us is greater than what divides us- be it parties, religion, tribe or class. I welcome everyone to be part of this movement. We have just began. Together, we will get there. I have learnt a lot from this campaign. I have learnt the positive and the ugly sides of our politics. That has made me smarter and even more determined to make a contribution, together with all well-meaning country men and women! Above all, this campaign gave me an opportunity to listen to people. From brick layers to boda-boda riders. Health-workers to teachers. Our retired senior citizens to those who serve in our armed forces. People from all walks of life! I am energized by your love for a better country. I am inspired by your hard work and sacrifice. I share in your dreams for a better day. It is time for me to bring the Ghetto Parliament to Parliamentary Avenue, and no one can deny that the Ghetto Parliament is strong! This is the leadership of the common people. We shall not just have our meetings in Kampala’s luxury hotels, but in our homes, schools, hospitals, shops and bufundas across the nation. This is where I will be, because that is where most of us are! And this is where we will create the change for which I ran in this election! This is not the end. It is just the beginning of a new chapter in the story of Uganda. A phase in which instead of disempowering the common person, we empower them to rise up and start to build their nation with their own hands. I will be there with you all, every step, all the way! In the coming days we shall have community meetings for the people of Kyadondo East, and I will also not forget my supporters in the rest of the country and beyond. I was once a ghetto child with dreams that everyone thought were unachievable, but here we are today- exceeding those expectations! Young people- be inspired! I am grateful that you have embraced my message- the future isn’t tomorrow. The future is today! I know your expectations for me are high and I am ready to make you proud.